The present Survey is the nineteenth in a series of reports prepared annually by the secretariat of the Economic Commission for Asia and the Far East. A major object of these Surveys, and of the quarterly Economic Bulletins which supplement them, is the analysis of recent economic developments in, and affecting, the countries of Asia and the Far East in so far as these developments are shaped by, and help to determine, their policies. It has been the established practice since 1957 to examine in the annual ECAFE Survey a specific aspect of the economies of the region, in order to study long-term trends and their implications for national policies. 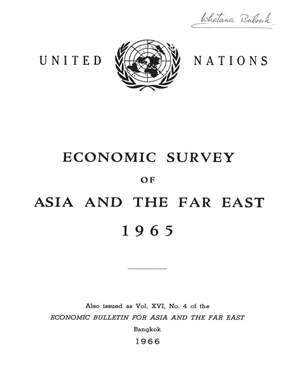 The present Survey contains, in the first four chapters forming Part One, a study on economic development and human resources; this is followed by Part Two which consists of three chapters wherein the economic developments in the ECAFE region since the Second World War and in 1965 are reviewed on the basis of information available to the secretariat up to the time the Survey was written (January 1966). The secretariat acknowledges with thanks the co-operation received from the International Labour Office, the Food and Agriculture Organization and the United Nations Educational, Scientific and Cultural Organization in the preparation of Part One of the present Survey.